Reconstruction programme of 5000 primary schools and thousands secondary schools in order to fulfil knowledge centred development of future Sri Lanka according to Mahinda Chinthana manifesto. 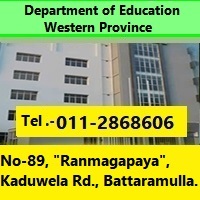 Structural activities of schools in western province (increasing parallel classes, changing of name, starting new classes, closing schools, re-opening, school amalgamation uplifting provincial schools to national school standards. Preparing information using census data and giving it to relevant parties. Preparing duty list of staff officers in the department and delegating duties. Local and foreign training programmes of Education Administrative officers and matters related to overseas scholarships.